Our Speech and Debate Team is a great way to build critical thinking, writing and speaking skills. Open to all, the team took top honors at the Ohio Forensic Association State Championship Tournament in 2016, 2017 and 2018. Full story. The University of Akron Speech and Debate Team, housed in the Buchtel College of Arts and Sciences’ School of Communication, is a co-curricular program offered to eligible undergraduate students across academic disciplines. Participating students learn and hone their critical thinking, writing and speaking skills while representing The University of Akron on a nationally competitive stage. The UA Speech and Debate Team is recognized as a prolific intercollegiate forensics program. Although the team is more than a century old, during the past 15 years, it has experienced a renaissance, traveling to more than 250 tournaments at the state, regional and national levels. At the 2016 Ohio Forensic Association State Championships, UA won first place honors in team sweepstakes, the OFA Founders Cup for cumulative sweepstakes points, and 12 individual state championship trophies. The reigning state champions are also active participants on the national level, fielding teams at the National Forensic Association National Speech and Debate Tournament and the American Forensic Association National Individual Events Tournament during each of the past 15 years. In total, since fall 2002, the team has amassed an impressive 697 individual national qualifications. 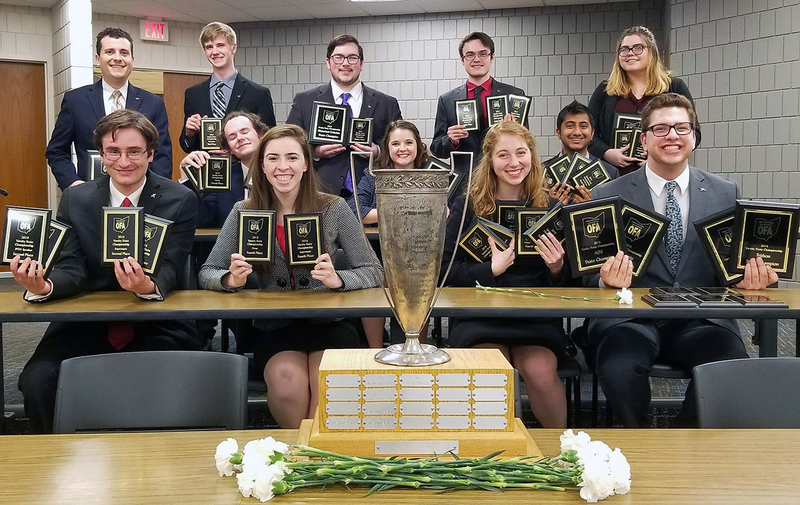 At the national level, The University of Akron Speech and Debate Team has placed seven times in team sweepstakes, is the only team from Ohio to have qualified for and attended both the NFA National Tournament and AFA-NIET for the past ten years, and individual students have earned four national finalist berths. In April 2005, The University of Akron Speech and Debate Team successfully bid for and hosted the NFA National Speech and Debate Tournament. In April 2009, the team successfully bid for and hosted the AFA-NIET, making The University of Akron one of the few institutions in the nation to have hosted both of these prestigious national tournaments. For more information, please e-mail the Speech and Debate Team Coach, Mark Rittenour, at mritten@uakron.edu.